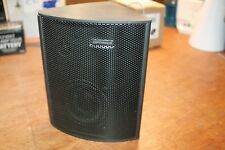 This is a used subwoofer. It does have scratches and scuffs but seems to be in fair overall shape. This unit has been used and in great condition. It has been fully tested and everything works as it should and sounds great. Physically the unit is also in great condition with no dings, breaks, and only a couple of light scratches from normal use. From my best ever collection.They are easy to place and were from the popular Optimus line with real wood cabinets that are in very good condition.These are fairly small 8.5 tall x 5 x 5. Should be easy to place. Used item. has scratches. Tested and in working condition. This is only one speaker, (Left) not a pair. This unit has been used and is in great condition. It has been fully tested and everything works as it should and sounds great. Physically the unit is also in great condition with no dings, breaks, and only a couple of light scratches from normal use.